With dox42 you can integrate data from SQL-based databases (Oracle, Microsoft® Access, SQL Server, DB2,...) fast and easily into automated documents. 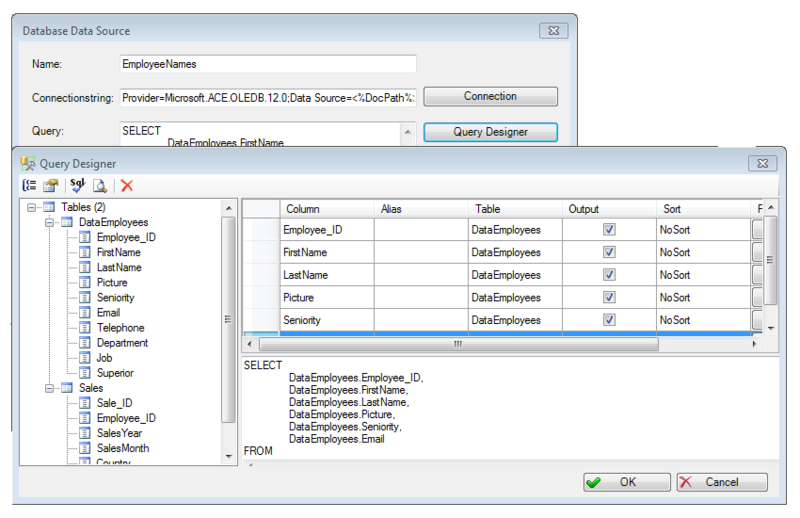 Just select the Data Fields requested and define selection criteria in the Query Designer. Take full advantage of the possibility to integrate multiple data sources into your document. dox42 automatically manages the dependencies between all data. Realize the full potential of dox42 by combining various data sources (WebService, SharePoint, XML, Microsoft® Excel,...). As soon as the data sources are configured in the Query Designer, you design templates with the dox42 Office Add-Ins conveniently in Microsoft® Word, Microsoft® Excel or Microsoft® PowerPoint. Certainly you can start with existing Word or Excel documents to build templates. When generating, dox42 runs the defined database query and automatically integrates the data into the documents. It's up to you, how to generate your document. Use the same template to generate on the dox42 Server or directly from the dox42 Add-Ins. The Sample Template "Order Confirmation Sport Shops" shows you, how to build an automated document with access to a database. Also have a look at the corresponding video tutorial.